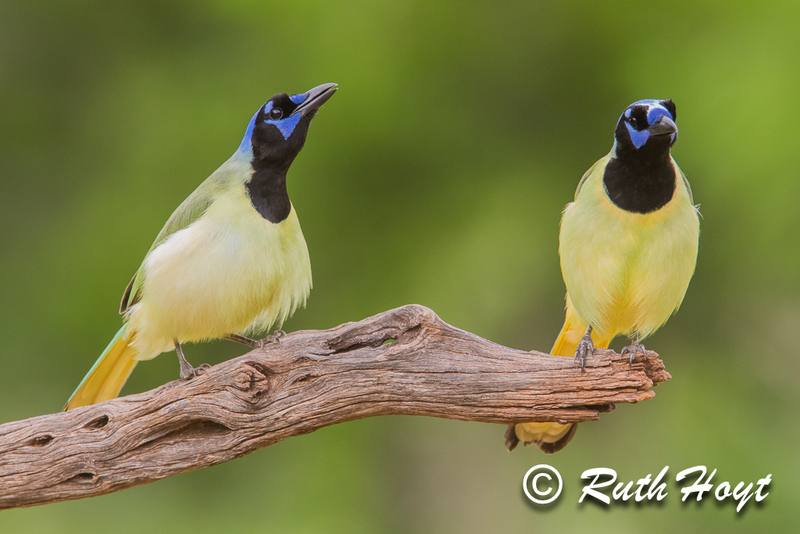 Green Jays are no different than any other species, in the way that they have a “longing for belonging.” I enjoy observing them as they entertain me with their antics, and this pair on the Laguna Seca Ranch proved to be very entertaining. The one on the left seemed to be trying to convince the one on the right to accept him as a friend or mate. However, the intended friend (or mate) played the part of a coy character and would only let him get so close before hopping away or flying elsewhere. Be sure to click on the photo to see the complete image. My mother’s birthday was April 20th and although she isn’t here with us physically, I often feel her presence. This was the case on her birthday Monday evening. I had been guiding photographers at the Laguna Seca Ranch Sunday/Monday and we were heading to the Jones Alta Vista Ranch outside Hebbronville for Tuesday/Wednesday. We stopped at the little church on Highway 1017 outside San Isidro and I know Mom would have loved to have seen it. 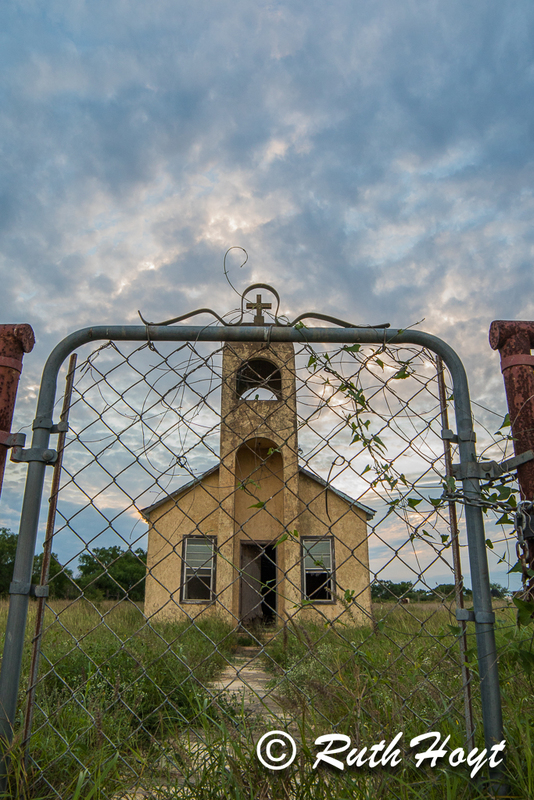 I could almost hear one of her favorite hymns, “The Old Rugged Cross,” playing as I photographed that little church. The weather had been cloudy and overcast, sometimes accompanied by drizzly rain, but as we stopped to take photographs, light exploded through the heavy clouds. I noticed something I hadn’t seen when I had stopped there previously – a small decorative strip along the top of the gate. The way the strip was shaped, I could compose the photograph so that the church’s cross on the steeple fit inside of it. Some vines formed a curly-Q above the cross. When I finished making photographs, I turned back toward the MiniBeast (my Ford Expedition) and sang Happy Birthday inside my head. Be sure to click on the photo below to reveal the entire image. I was guiding a group of photographers at the Laguna Seca Ranch Saturday and we were fortunate to get some sunshine that evening. 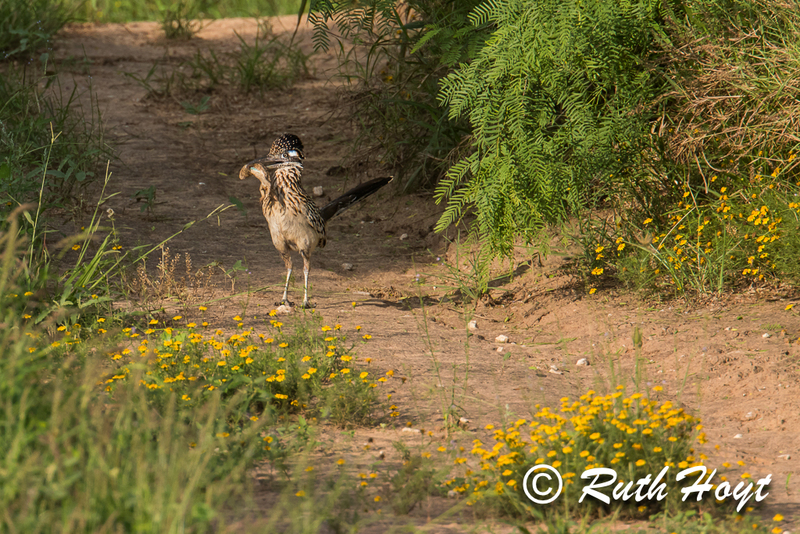 We noticed a Greater Roadrunner on the ranch road leading down into the photo blind area, then saw that he had something. The longer we looked, the more uncertain we were as to what he had, but he eventually turned just enough for us to see he had a male Mesquite Lizard. Even from the great distance we were photographing, we could see the turquoise coloring on the lizard’s belly! Be sure to click on the photo to see the entire image. 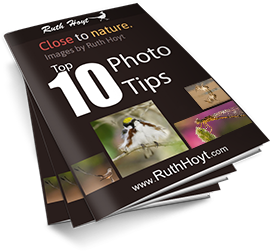 People who are familiar with the kind of photography I do know that I do mostly wildlife and nature photography. Occasionally I stray from the “natural” way I photograph and do something different. 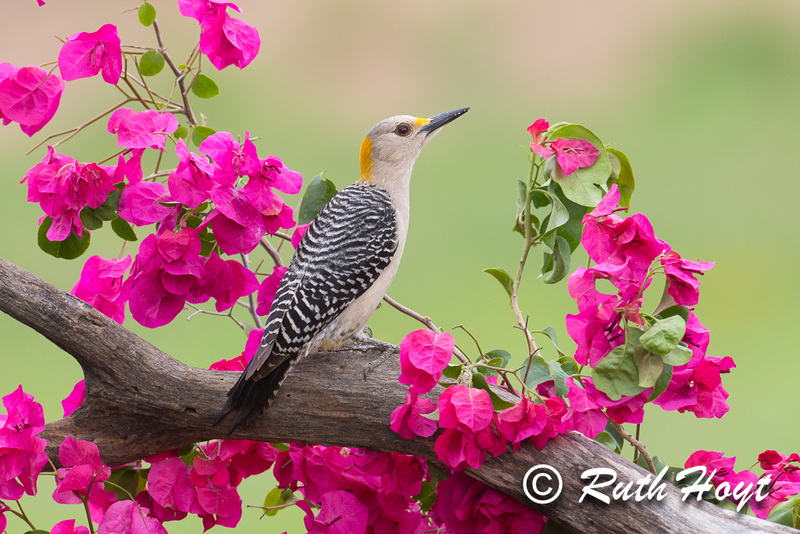 I guided a group of photographers last week who loved bold and splashy photos, so I clipped some Bougainvillea branches from my neighbor’s large bush (with permission, of course!) and brought them to the Laguna Seca Ranch. The result was exactly what they wanted – many birds visiting the “planted” plant. When I first viewed the scene, it almost blinded me because I thought it was overpowering and I didn’t take any photos. 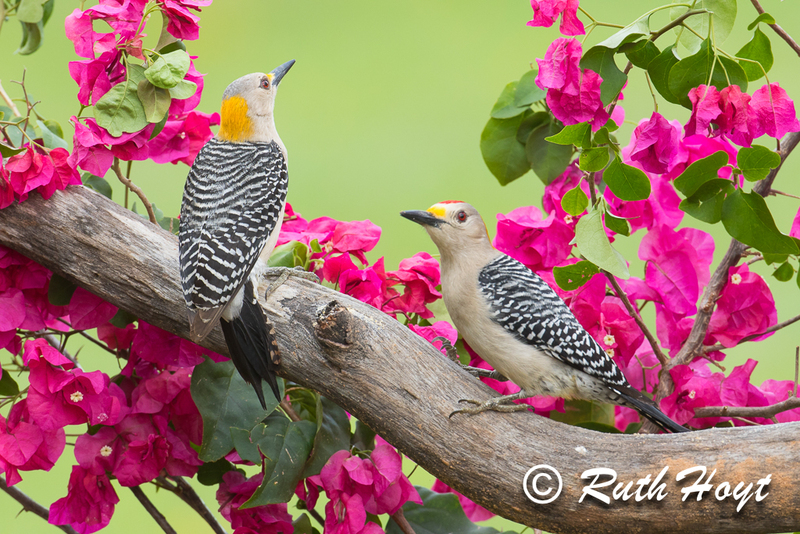 But then the Golden-fronted Woodpeckers paid the setup a visit and I took some photos. I’d like comments and thoughts about these three photos, with a focus on answering these questions: 1. In the first photo, do you prefer the two birds on the setup to only one bird, even though they aren’t both facing the camera or even looking in the same direction? 2. The second and third photos are almost identical, but one has fill flash added and the other does not. Do you prefer one over the other? Please explain why. Incidentally, I have done no post-processing to any of these photos. I look forward to receiving your comments and thoughts. Reminder: Be sure to click on each photo to see the entire image. I was photographing in misty, drizzly weather at the Laguna Seca Ranch Friday morning. 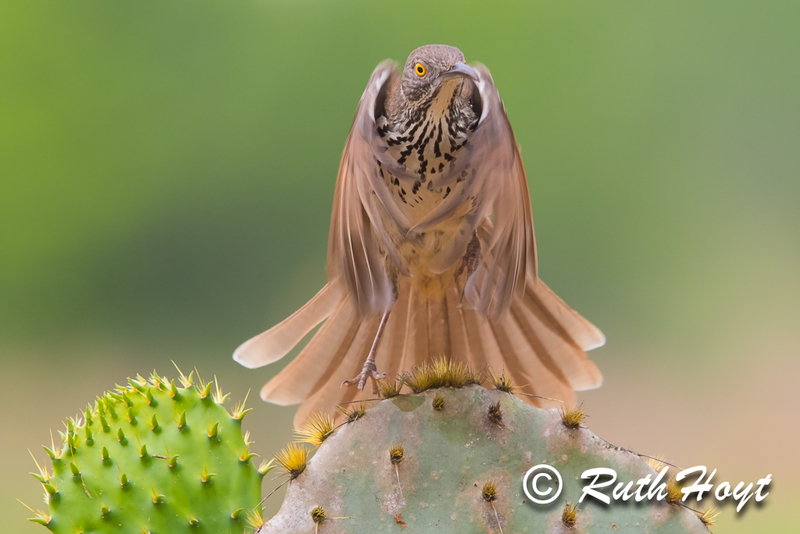 A Long-billed Thrasher came along and, from below, eyed a cactus near the water hole. I aimed at the top of the pads, hoping I’d catch the right moment. As it leapt up I fired away. When I saw the results, the bird’s pose reminded me of Darth Vader but with the wrong color cape and eyes. Click on the image to see the entire photo. Darth Vader, is that you?